Download your free copy of the 2018 Acquiring Trends research report. Today more than 95% of acquirers and other risk-bearing payments entities have formal programs in place to guide their merchants through the PCI compliance process. The goal of these programs is to reduce risk by making merchants aware of, and responsive to, their obligations under the Payment Card Industry Data Security Standard (PCI DSS). 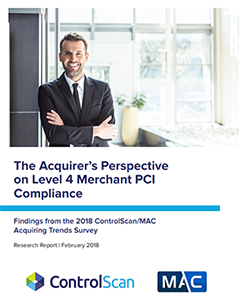 ControlScan and the Merchant Acquirers Committee (MAC) recently conducted our 2018 Acquiring Trends Survey to find out what is and is not working with acquirers’ PCI compliance programs. More specifically, this annual survey benchmarks important trends in how processors, acquirers, ISOs and payment facilitators are structuring PCI programs for reduced business risk. What does it take to get your merchants PCI compliant, and keep them there? Trends that are signaling what the future could hold for PCI compliance. Submit the form to the right for your free access to this valuable research report!